I’m on spring break. Well, Ellie is on spring break. Same difference. I always take the week off from work to play and do my taxes. I used to do the same with Brit. We would ski. Ellie snowboards. We didn’t get a chance to board here in Breckenridge. Ellie did enjoy sledding on a hill outside our cabin with her friends in the morning and later snow tubed Saturday afternoon. This is a late spring break. It would have been fine last year as the slopes were operating into June. Colorado is only at 65% snow pack this season. There’s enough snow still but it becomes slushy by noon. On a good note, the weather is awesome. 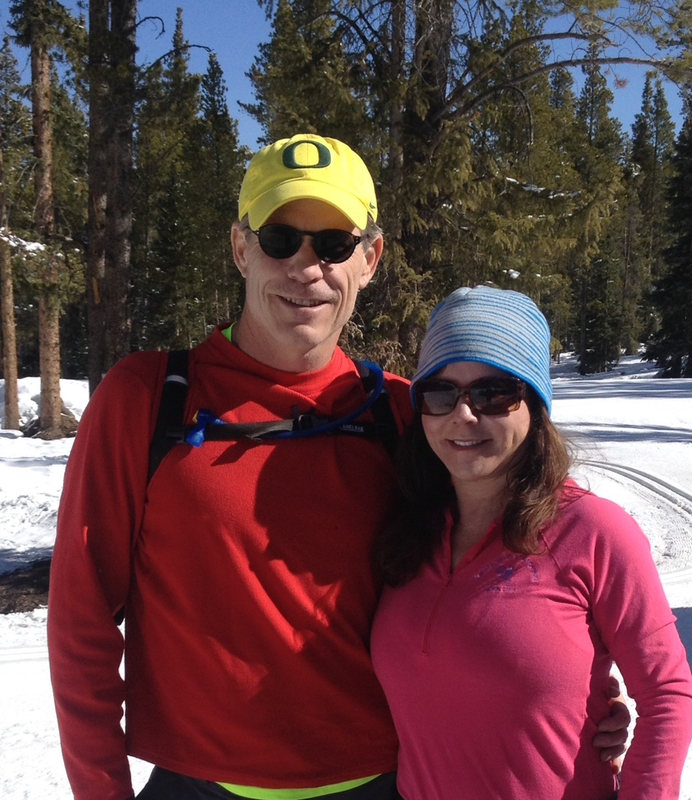 Both Karen and I eschewed jackets on our snowshoe jaunt while Amy and Dave skied cross country at the Breckenridge Nordic Center. We did this in the morning. It took Karen and me an hour even to traverse 1.75 miles. We completed the Willow Trail counterclockwise, and added a short spurn with the Engleman Trail. 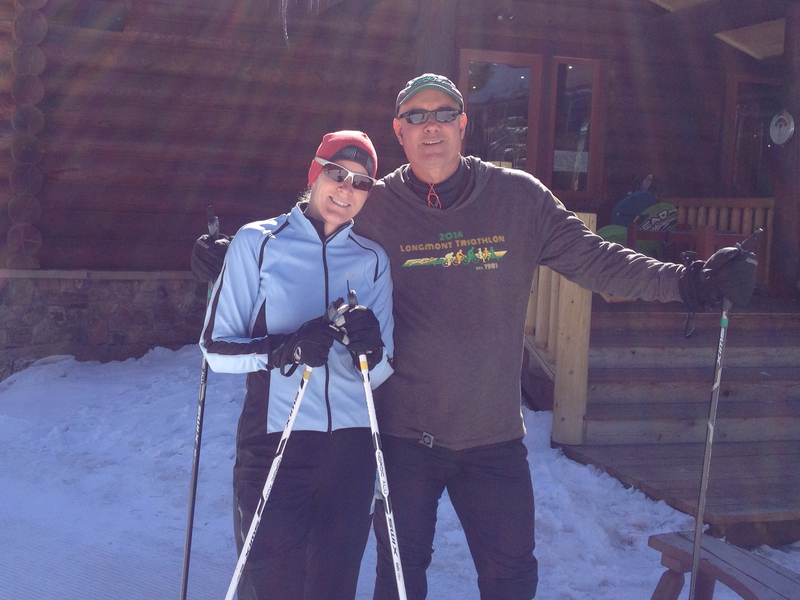 I completed a second loop while Karen waited for me in the lodge. Sometimes I don’t know when to quit. You’d have trouble knowing when enough is enough out here too, it’s just so gorgeous. In fact, Dave and I both returned in the afternoon for another round. Springtime in the mountains, with both snow and full sun, is not to be taken for granted. On this second round, I trekked the Engleman Trail much higher, ascending into the upper trail section. Here I discovered the Peaks Trail which follows the eastern side of the Ten Mile Range all the way to Frisco. 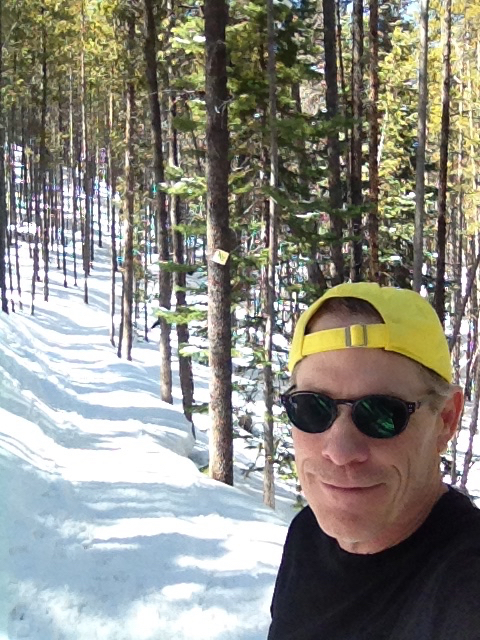 I wasn’t prepared for that long of an outing but got in another 90 minutes snowshoeing, running about a quarter of it. Dave and I rejoined in the lodge for a couple of Hop Hunter IPAs. I’m not sure I can describe in words just how satisfying this second hike was. The trail entwined thick forest with snow-laden single track, and I was all alone for most of it. 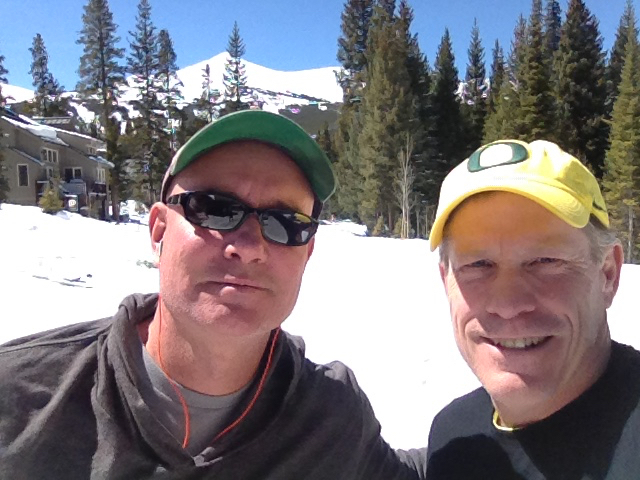 I truly felt religion snowshoeing through God’s high country in Hallmark card perfection. I was high the rest of the day – which mainly consisted of snacking, watching the Final Four, and having an early Easter, ham dinner. Karen and I returned home Sunday so she could teach an aerobics class. I’ve since called my mom to wish her a happy Easter. Ellie remained in Breck with her friends for another day of snow and fun. Still full sunshine out there on the Front Range. I think I might go for a run.